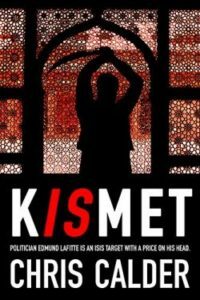 My new novel kISmet has just been launched. At last! How long does it take to write a complete novel? By ‘complete’ I mean a manuscript of conventional length — between seventy and eighty-five thousand words. From conception of the plot through to the finished work, it can take years. In the case of kISmet, the original plot idea was conceived shortly after the declaration of the Fatwa on writer Salman Rushdie in 1989. A long time ago! The provisional title was Fatwa and the plot concerned a Member of Parliament who makes an inflammatory speech in the House of Commons, castigating the fundamentalists who ruled the state of Iran at the time. It results in a Fatwa being placed on him. Like Edmund Lafitte, the protagonist of kISmet, that MP also had two women in his life and nearly lost his head, if you see what I mean. The idea had languished in a corner of my mind for twenty-odd years, eventually morphing into the plot that emerged as the story line for kISmet. I started writing it two years ago, when I was completing my last novel Celeste Three is Missing. When working on a book, I like to have another on the go at the same time. So when the dreaded ‘block’ descends, I just leave the work in progress for a short while and concentrate on the backup. That works for me. Every day I try to add a bit to the work in progress and also check the previous few days’ output. Editing and correcting continuously, but also removing whatever needs to be taken out. That’s the hard part. So how long does it take, start to finish? For kISmet the actual writing took about ten months in total. All I can hope for is that it was worth it. Please let me know what you think of the story and especially how you feel that it could have been better. Get in touch– email me; I will always respond. As an author I try never to lose sight of the fact that readers of fiction expect to be diverted and entertained. As I see it, taking on board your views is the only way to improve what I do. You Love Reading? Help the Author!